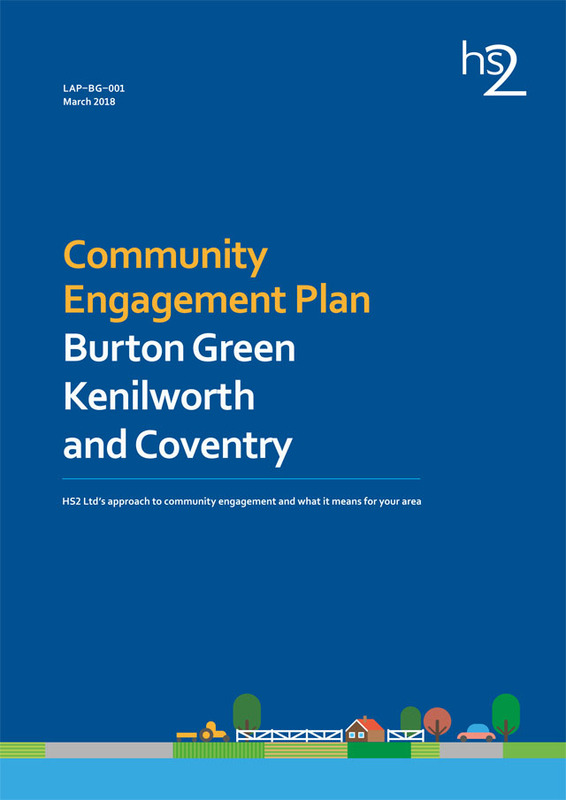 The HS2 Local Engagement Plan has been developed to provide information on HS2 engagement with communities and stakeholders and includes a six month look ahead of the works in the area. 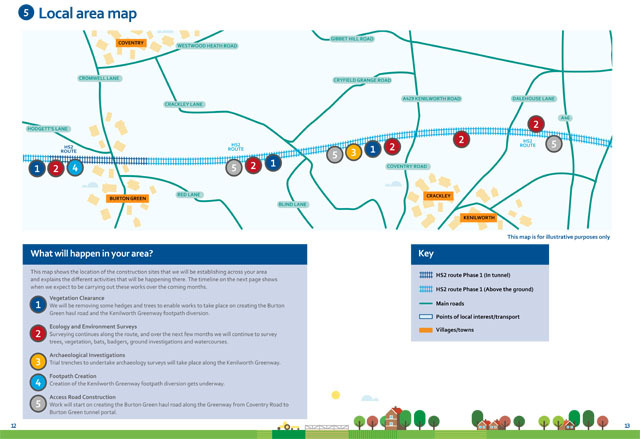 These plans will be updated periodically as the programme of works continues to be developed. Apologies had been received from Cllr. Caryll Green. A report had been circulated. Dianne explained the various items. The greatest expenditure since the last meeting had been that of the calibration of the Speed Gun. 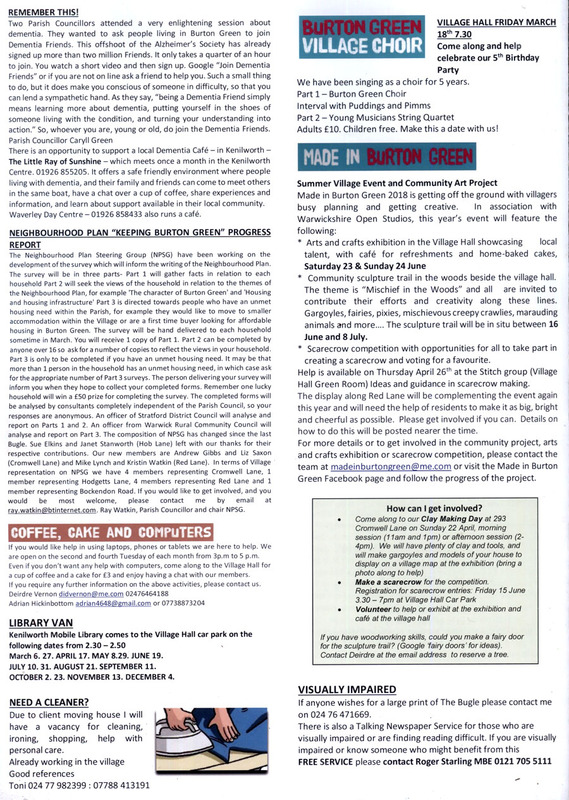 50% of the cost was to be met by WDC Community Forum and the Parish Council was to be approached for the remainder. In future the police would be paying for calibration. A further £15 in subscriptions had been collected. Q. Could a new defibrillator box be purchased when this was moved to the new Village Hall? Traffic speed: there was new signage on Red Lane but little warning at the Kenilworth end and speeding was still a problem. Some residents still had concerns about the siting of the new Village Hall entrance. It had been reported that a crossing would take pedestrians across Red Lane when they were using the newly sited Greenway. There were worries about the position and safety of this. There had been a number of burglaries in the area although the police said crime levels had not increased. Residents were asked to be vigilant. Concerns were expressed that the Neighbourhood Watch Scheme no longer appeared to be active. There were problems with dog poo bags being left lying around or added to residents’ green bins instead of using the designated bin by the Greenway entrance on Cromwell Lane. Rona had been contacted by a resident who wished to be more involved in the community. Rona was to meet her and suggestions were made regarding involvement in Bugle distribution, the computer club and other activities. Retired of Burton Green lunch March 16th: This was going ahead with 45 bookings. It was declared a good idea to put the menu in the Bugle. Balsall Common bingo sessions were to be publicized at the event. Village Clean up Feb 11th: Thanks were extended to those who took part with over 30 bags of litter collected including a large number of empty vodka bottles. Beer cans had also been removed from the Greenway. 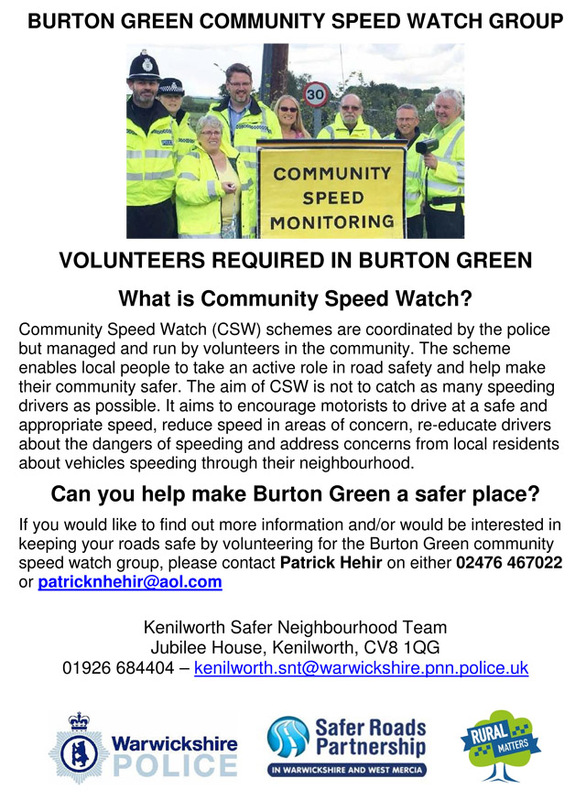 Report from Kenilworth Forum Feb 13th: Burton Green had again won the online voting for a police anti-speeding presence. No-one was available to present a report. Much work continued to be carried out regarding the new planned hall. Planning notices had now been erected. Andy reported that representatives of the Parish Council were to meet on the field where the new hall was to be sited in order to discuss their response to the planning application, which would be a supportive one. HS2 mitigation planting was to take place on part of the site but there was still uncertainty about the remainder of the field not to be occupied by the hall. 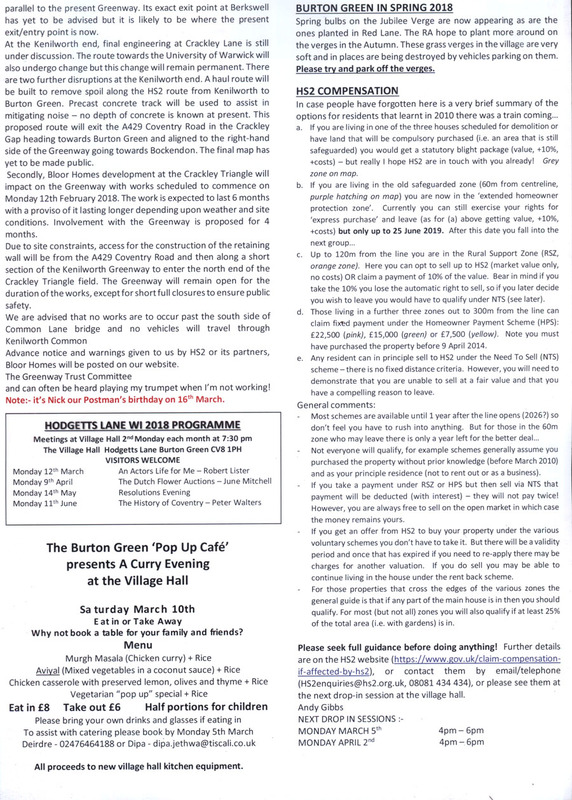 Lesley Tacon had contacted the BGRA suggesting a collaborative approach by different organizations to HS2’s “community pot.” This was felt to be a sensible suggestion. It was believed the Greenway Trust had already submitted a bid. Hilary would get in touch with Marlene for further details. The Neighbourhood Plan group were fact finding ready to send out a survey to see what residents felt was needed in the village. 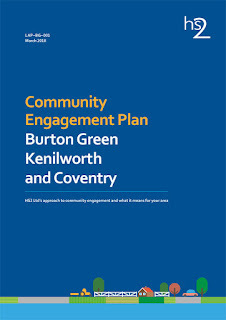 Cllr Green had sent a report as she was unable to attend. She said works had started on the Burrow Hill site, the PC’S objections having fallen on stony ground at the WDC planning meeting. The PC had hoped for a further village consultation, but it was not allowed. 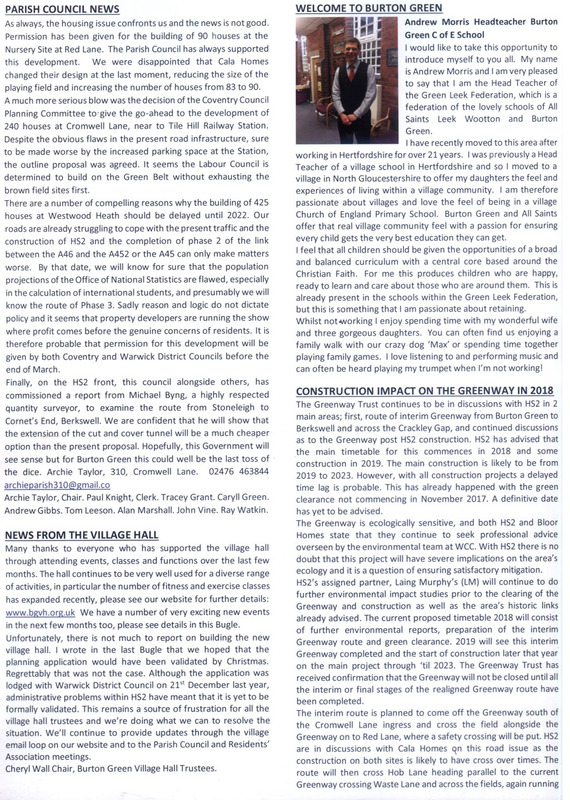 Plans had also now come to light for the new village hall and these would be discussed at the next Parish Council meeting on the 19th March. Work by the neighbourhood plan group under Ray Watkin were forging ahead. The group taking part in that was putting in a tremendous amount of time and effort. Last–ditch attempts were being made to persuade HS2 to have a rethink on the length of the cut and cover tunnel. John Vine and Caryll Green would be retiring from the PC in May and there would be two vacancies (or more) to be filled for the one year until the four-yearly elections come around in May 2019. The Clerk or any councillor would be very glad to hear of anyone interested. Cllr. Green should be very glad to see herself replaced by another woman. 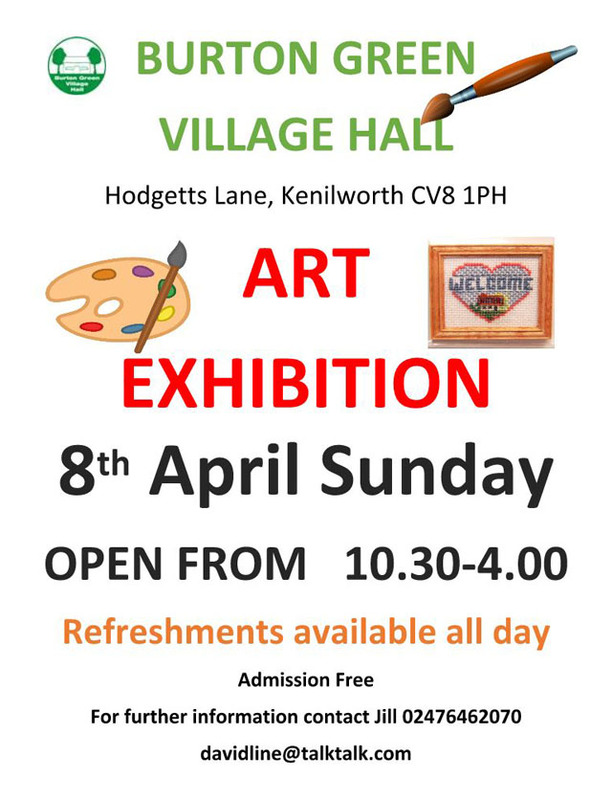 She exclaimed how lucky we are to have in Burton Green so many organisations all pulling together for the benefit of the village. Andy added that the work by Michael Bing on the cut and cover tunnel (discussed in a previous meeting) was to be funded. There were two Bugle delivery areas that had not been covered. Dianne and Bron kindly agreed to do these. GDPR [General Data Protection Regulation]: it was felt important to find out more about the changes to data protection law as this would affect holding people’s details for the village loop as well as for the work of various village groups. Happy birthday wishes were extended to our postman for March 16th. Rona had written a letter of support for the choir’s application for funding to the community Forum. Unfortunately the bid had been unsuccessful. The committee agreed that because the choir contributed so much to the spirit of the village, £100 would be donated to the choir. Judi and Janet, both choir members, thanked the committee for their generous gesture and explained what their funding was needed for. July 10th, September 11th, October 1st (AGM), December 11th. 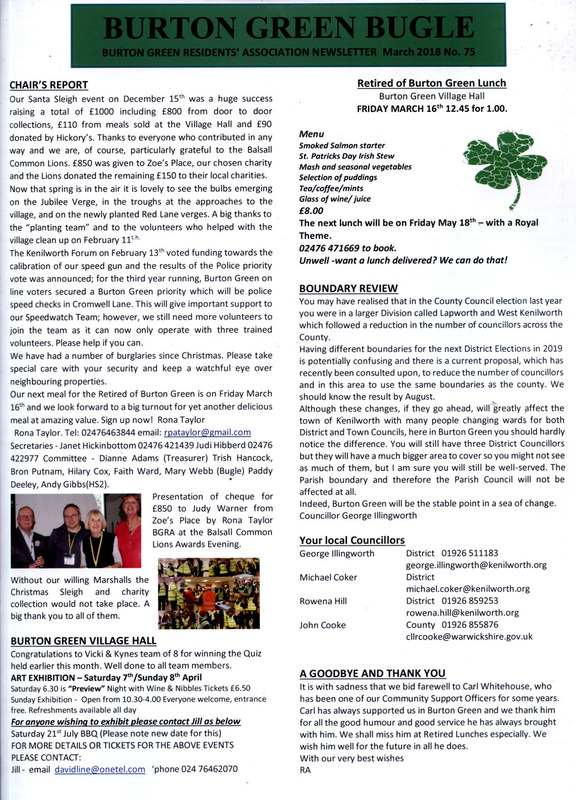 The March 2018 edition of the Bugle has been published. There's a crackpot scheme in California to build a railway connecting San Francisco and Los Angeles using technology very similar to HS2. The project had a similar timescale to UK HS2. A new report claims that the California project will cost two or three times the original cost and will be at least 4 years late in delivery, if it happens. "The price of the California bullet train project jumped sharply Friday when the state rail authority announced that the cost of connecting Los Angeles to San Francisco would be $77.3 billion and could rise as high as $98.1 billion — an uptick of at least $13 billion from estimates two years ago. The new estimates will force California's leadership to double down on its political and financial commitments if it wants to see the system completed, against a backdrop of rising costs, years of delays, strident litigation and backlashes in communities where homes, businesses, farms and environmental preserves will have to give up land to the rail's right-of-way. "At first glance, the High Speed Rail project is still over budget and the funding to complete the program hasn't been identified," said Jim Frazier (Democrat-Discovery Bay), chairman of the Assembly Transportation Committee, which will hold an oversight hearing on the plan on April 2. "We still have no realistic way to pay for the project." "Initially a rathole, now a sinkhole, soon it will be an abyss in which more and more tax dollars are forever lost. I speak of the never-ending scam called High Speed Rail," said Sen. Andy Vidak (Republican-Hanford). And there's another interesting article below. "...continuing to spend billions on the bullet train is an exercise in futility, absurdity and malfeasance"